Dylan McGeouch has dropped out of the Scotland squad for the friendly double-header against Costa Rica and Hungary. The Hibs midfielder was handed his maiden call-up to the national team by Alex McLeish but will be forced to miss out after picking up a groin injury in training. 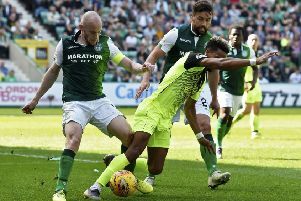 He was absent from Hibs’ 1-1 draw with St Johnstone in the Ladbrokes Premiership on Friday evening. Though he met up with the rest of the Scotland team at the Oriam training centre in Edinburgh on Monday, after being put through his paces it was decided that he wouldn’t be fit in time. McGeouch, who initially joined Hibs on loan in 2014, suffered three injury-blighted seasons while the Easter Road side were in the Scottish Championship. The 25-year-old revealed earlier this season how a meeting with a specialist in London, recommended to him by Scotland and West Ham United midfielder Robert Snodgrass, had helped him overcome his niggling injuries. The former Celtic midfielder has already played more games this season - 35 - than he managed in any of the previous three campaigns. McGeouch spoke earlier this week about how a consistent run of fitness had allowed him to find his best form, and force his way into McLeish’s plans for the friendly double-header.